The beaming smile that was etched across Angus Kernohan's face was matched by the glisten of the gold medal that hung proudly around his neck. Having been a regular in last season's team, Kernohan would have had his sights set on making a big impact in this year's Six Nations. Those plans got off to a false start when he was unavailable for the first two games due to a hamstring injury, until he made his comeback for Ulster in the Guinness PRO14. The 20-year old then had to stay patient when he returned against Italy and France, before he finally got a chance to showcase his explosive speed during last night's Grand Slam success in Wales. With Ireland 10-0 down and desperately needing a moment of magic from somewhere, Kernohan duly obliged just before the break when he slalomed around the Welsh defence, before the ball was worked wide for Jonathan Wren to score one of the tries of the tournament that proved to be absolutely crucial. "Sometimes rugby is just a game where the ball just doesn't come to you, particularly on the wing," Kernohan maintained. "It can be frustrating but I think you just have to trust in the system as in there were a couple of times in the last game, there were flankers carrying down the channel and they made a good impact as well. "That was a lovely ball from Jake (Flannery), just to get that offload away. Whenever there is a bit of space in front of you, it's nice to put the foot down. "Hopefully I will be able to get the ball a bit more in the future. It's frustrating that forward pass for the try but it was nice to carry the ball." The euphoria had just about settled after Ireland beat Wales in Colwyn Bay for the first time to seal a second Grand Slam in the country's history, but the sheer scale of the achievement hadn't yet sunk in for any of the proud boys, who turned into men over the last six weeks. "I'm speechless, to be honest," Kernohan smiled, as he attempted to make sense of it all. "We didn't make it easy for ourselves but we have been a team right throughout the championship that has dug in and found a way to win. "I think that's an important thing behind great teams. We have real unity in the team and that common goal of putting teams to the sword. "We did that in the end and it just shows with Colm (Reilly) coming on at the end and scoring. "Your replacement scrum-half making such a big impact shows how much we trust our squad and rely on those guys. I'm completely elated, it was a brilliant win." Like every other member of the squad and backroom staff, when Kernohan reflects on the tournament, he can do so with immense pride. He may have felt like he was playing catch-up having missed the first two games, but he certainly made up for lost time. "Coming in and playing those three games means I have played over half a championship so you do feel part of it," he added. "Hopefully I have played my part in helping the boys get the victory. It was a really closely knit team and it feels unbelievable. "It is a different kettle of fish but it is something that is really nice to play with guys your own age. "When you pull on that green jersey, it's very special. Being able to come out here tonight and getting the ball a bit more and in more space, it's nice to be able to attack. 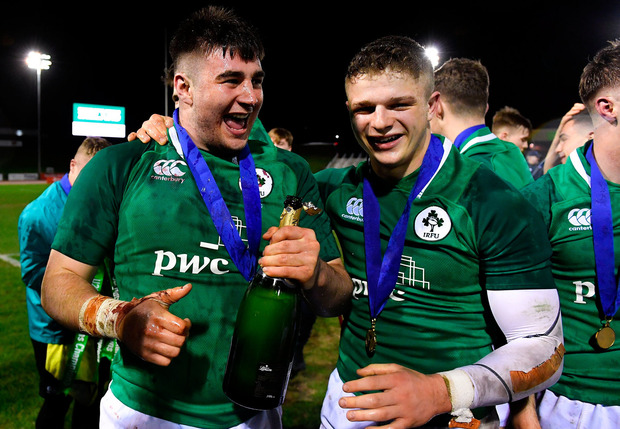 "The U-20s is a very important pathway, it's just brilliant."